The Grotte de Font de Gaume is a series of caves containing prehistoric paintings just one km from the small village of Les Eyzies, in the valley of the river Beune, which itself forms part of the Vézère Valley world heritage site in the Dordogne. The system was rediscovered in September 1901. 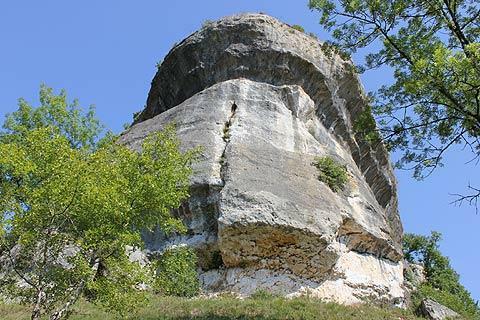 The entrance to the grotte sits at the bottom of a large limestone cliff. The ticket office and parking are about 400 metres further down the hill, with a very pleasant walk between the ticket office and the caves. The cave was settled about 25,000 years ago, during the Ice Age, when animals such as mammoths and reindeer were common in the area. Passing through the narrow entrance to the cave you reach a long crevice formed by thousands of years of erosion, which in turn leads to other cave areas. The Font de Gaume grotte contains numerous colourful paintings dating from the Magdalenien period. Of more than 200 paintings in total at the Grotte de Font de Gaume (there are also some engravings), the majority are of bison. Mammoths, horses and reindeer are also represented, along with various other animals. The prehistoric painters almost never painted either animals that they used as food or pictures of people. The painters have skillfully used the shape of the rock, and shadings of paint colour, to add vitality and a three-dimensional look to their paintings. Unfortunately only a small part of the total can be viewed by the public. But this simple description is to undersell the experience of a visit to the Font de Gaume caves - the paintings really are extraordinary in their perfection and colour, and a visit is highly recommended. You really do feel a bond with the artists who decorated these caves so long ago, with only the dimmest light and a handful of painting materials to work with. Interestingly, large quantities of painting pigments and materials have also been discovered, suggesting that the painting was approached in quite a professional manner. Only 200 visitors per day are granted access to the caves, to help protect them, and all visits are as part of a guided tour. Because visitor numbers are so limited it is highly recommended to book your tickets before you arrive. If that is not possible try to arrive early in the morning for the best chance of access. 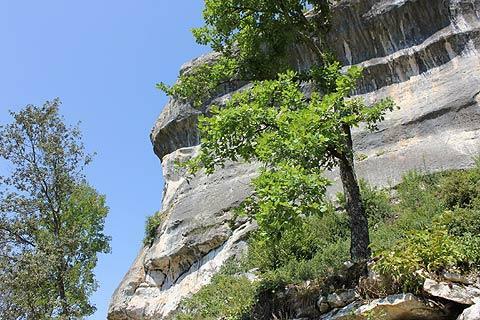 Photography is not allowed in the caves - the photo of bison above was kindly supplied by the Font de Gaume tourist board and is copyright CMN Paris. 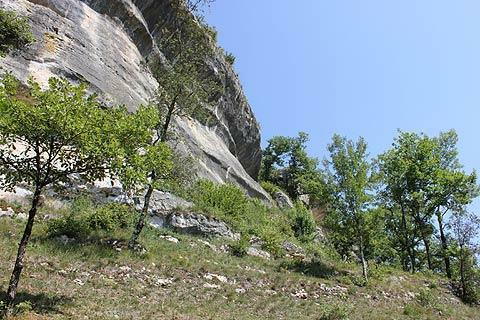 Our own photos are taken on the path approaching Font de Gaume, not in the caves! The region around Font de Gaume and along the Vézère Valley contains numerous prehistoric settlements, traditional Dordogne villages, medieval castles and scenic highlights - see our Vézère valley travel guide for details. The caves are also a listed French National Monument.